Structural industrial mezzanines are exceptional for industrial and commercial space. They are considered capital equipment and thus have significant tax advantages over permanent construction. CSI designs them for the specific purpose for which they are required. Column spacing, capacity, railing, clear height, decking, foot plates, even internal beams can be and should be adjusted based upon the application and purpose of the industrial mezzanines. Structural industrial mezzanines can be free standing or building column connected. For Structural Mezzanines in Chicago, Illinois, Wisconsin, Indiana, the Mid-West states CSI is the logical choice. When our client has not standardized on a manufacturer we strongly recommend Steele Solutions. 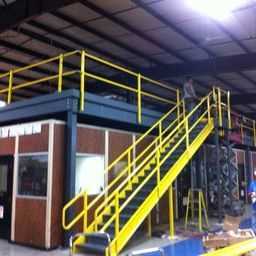 Steele Solutions is who we most commonly utilize as an exceptional manufacturer of structural mezzanines. CSI provides structural mezzanines when customers need to take advantage of economical cubic footage above existing work space. IF YOU DO NOT SEE SPECIFICALLY WHAT YOU ARE LOOKING FOR, Contact us. We offer a wide variety of structural mezzanines, including column spacing, decking, bases, railing, custom designs, designs for specific purposes, seismic, and more. Our objective is to assist you in obtaining your goals and objectives. If it is determined that a structural mezzanine will not assist in achieving your objective we have several forms of mezzanines for many different objectives and environments: Shelf Supported, Rack Supported, Work Platforms, and more.